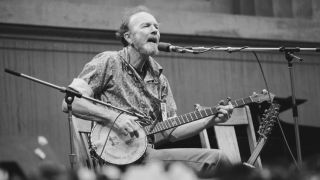 Pete Seeger, the folk musician, political activist and key figure in the American folk revival, has died in a New York hospital aged 94. Seeger's six-decade career began shortly before the outbreak of the Second World War, when he found employment playing the banjo and worked on the Archive of American Folk Song at the Library of Congress. By 1940, Seeger was on the road alongside Woodie Guthrie performing political songs and recording his first album alongside The Almanac Singers. He was enlisted in the US Army in 1942 and served until 1945, whereupon he returned to performing. In 1948 he formed a new folk group, The Weavers, which had hits throughout the early '50s. The group's politics saw them targeted by the McCarthy-era witch-hunts, and Seeger was called to testify by the Committee on Un-American Activities in 1955. After refusing to answer the committee's questions, Seeger was cited with ten counts of Contempt of Congress. By 1960, Seeger had become a key player in the burgeoning folk revival. In 1961 he was found guilty of contempt of Congress and sentenced to a ten year jail term, although this was quickly overturned on appeal. A mentor to key figures of the folk revival - including a young Bob Dylan - Seeger's songs, storytelling and dedication to political action meant his influence was felt far outside of the folk scene. He was an outspoken activist who was vocal on controversial issues from Vietnam to the environment, and whose political beliefs and music were intrinsically linked. An accomplished six- and twelve-string guitarist, banjo player and singer, Seeger was also a curator of traditional folk song, prolific recording artist and formidable songwriter, who penned several songs that became huge hits including If I Had A Hammer (The Hammer Song), Where Have All The Flowers Gone and Turn! Turn! Turn! (To Everything There Is A Season). His passion and musicianship went on to influence generations of artists, establishing Seeger's reputation as the father of American folk. Bruce Springsteen's 2006 album We Shall Overcome: The Seeger Sessions was a collection of songs often performed by Seeger, and in 2009, Seeger and Springsteen sang Woody Guthrie's This Land Is Your Land at President Obama's inauguration.